CCS is AHIMA. Wrong organization. LOL. James - absolutely nothing wrong with having dual certifications from different organizations. Congrats on obtaining your CPC-P! I guess my question is what what type of coding do you wish to do? Given you have your payer designation, are you looking at physician, outpatient, etc.? The AAPC credentials of CPC and CPC-H are excellent ones to have in that regard. You may wish to look into AHIMA's newest CCA credential - which promotes competency in both facility and physician coding. After obtaining that, you can decide on your next certification. You may find you enjoy inpt coding - then AHIMA's CCS is the one to get. There are two different certifications from AHIMA. The CCS and the CCS-P. The CCS is inpatient coding, the CCS-P is physician coding. James-I hold the CCS-P credential and find it very valuable. I say go for! I want to applaud you and anyone else who wishes to further thier credentials whether it be with the AAPC, AHIMA or both. SHAME on you medcoder9 for your snide reply, nowhere in Jamesmmm question did he indicate that he thought they were under the same organization. Part of our code of ethics is professionalism which you obviously lack. You go Jamesmmm do not let people like medcoder9 shake your eargerness to further your education! What did I do? If he does want to learn more about CCS-P, AHIMA website is the best place to go. And it is not as if you answered his question anyway. ...I thought of the CCA also, but then I thought that since I've gotten one with AAPC, why not try AHIMA? Besides if you look at the narrative on CCA as compared to CCS-P, the CCSP mentions "mastery....NOT entry level..." But CCA "is the only HIM credential currently recognized by NCCA...worldwide"
One of the major concerns will be re-cert: I am sure I will have to work extra hard on two re-certs...I don't know if any CEUs can be used for both? If possible, please chime in about CEUs : do certain CEUs get accepted by both AAPC & AHIMA? Also, if I don't join AHIMA ($165 pr annum) most items cost at least 25% more...the test is $300/$400 member/non member! I got the CCS-p prep and so far,90% or more of the multiple choice I have gotten correct! James: If you've not already done so, check out justcoding.com. 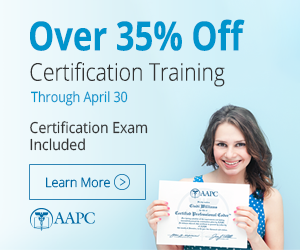 I renew a basic membership annually - they offer both AAPC and AHIMA CEU's. In addition, I feel it's a great site. I deal primarily with cardiology/interventional radiology, so it's interesting to read about other specialties. ...I billed for CT Surgery years ago...that when (1989) I got started... I've been teaching coding and billing since 1998, and since teaching beginners dosen't lend itself to a great deal of depth, I haven't been challenged, but now the employers want some higher level of expertise, so I need to prove my ability...thanks agaain!